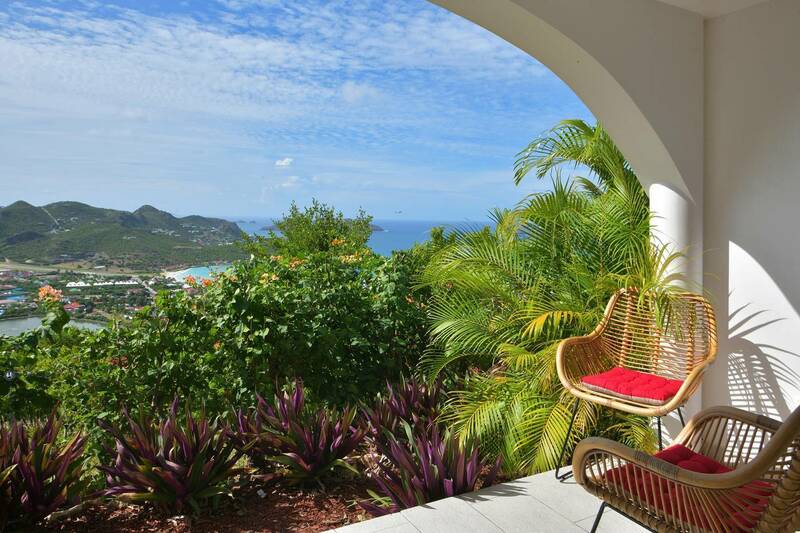 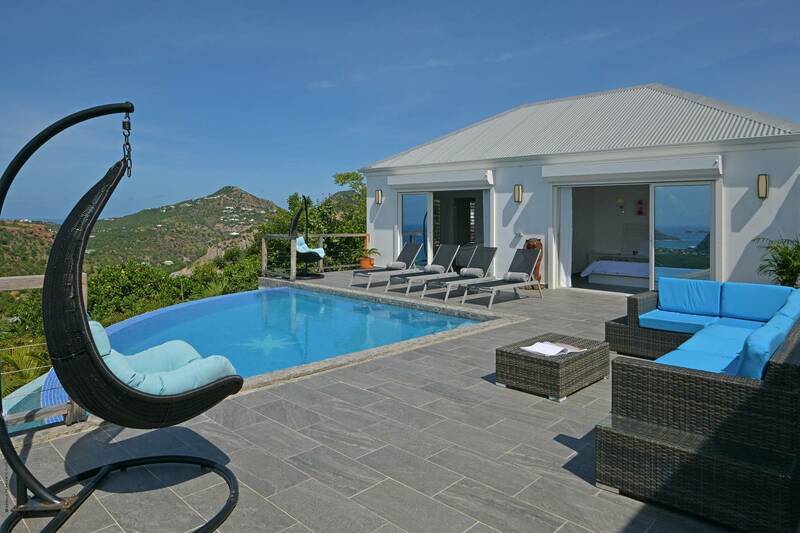 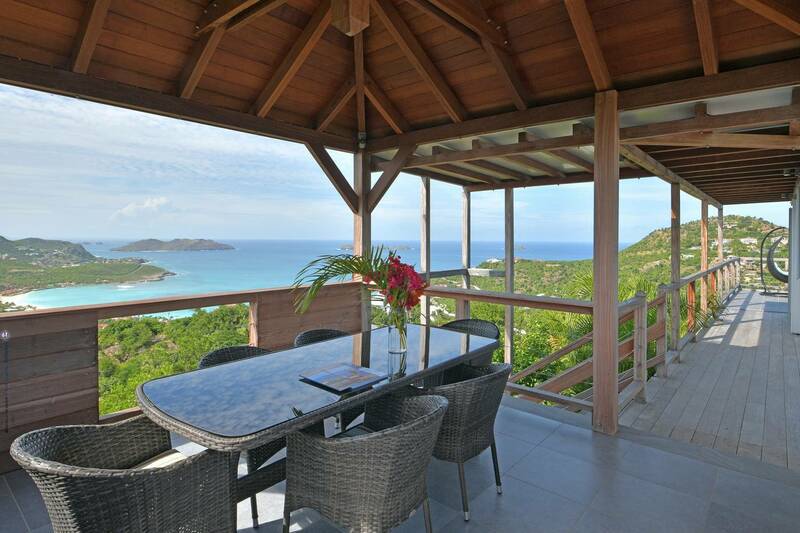 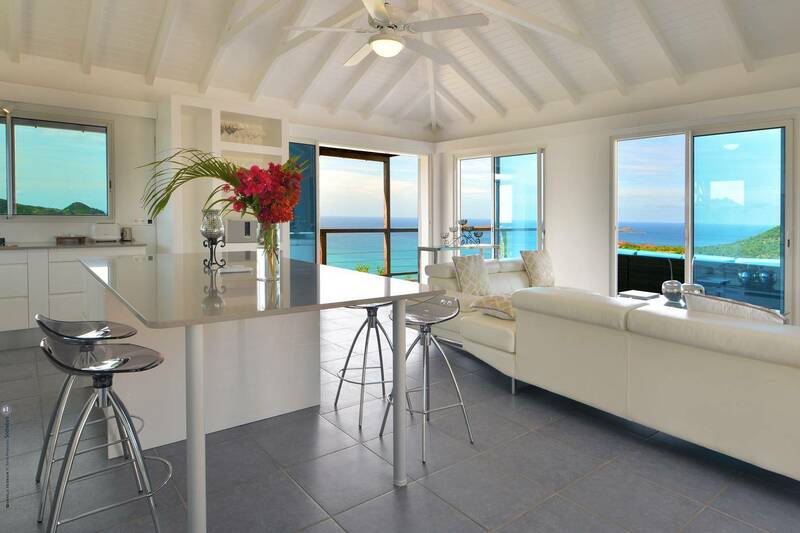 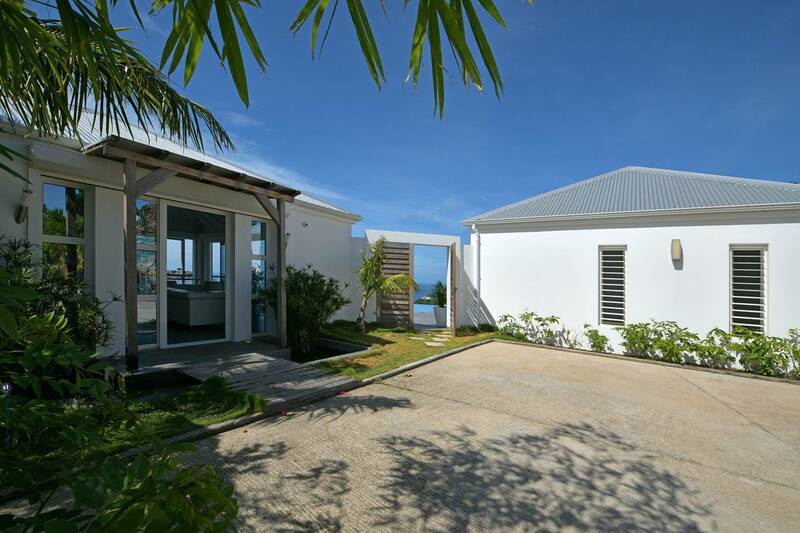 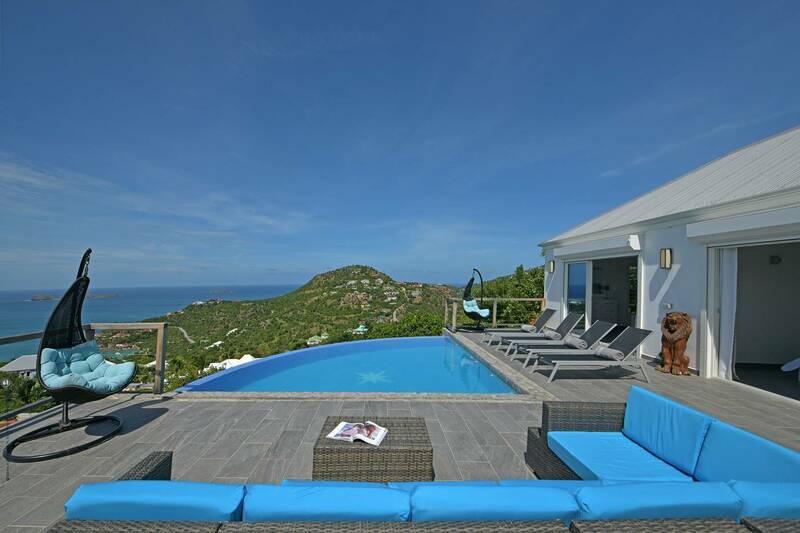 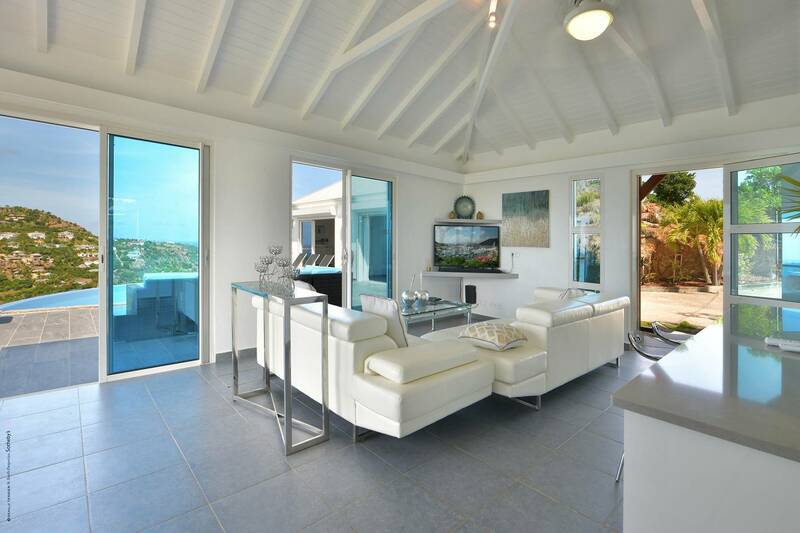 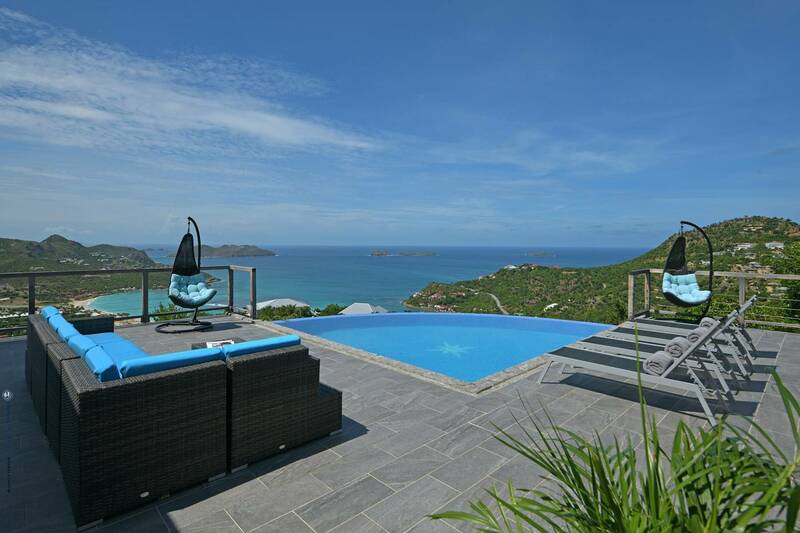 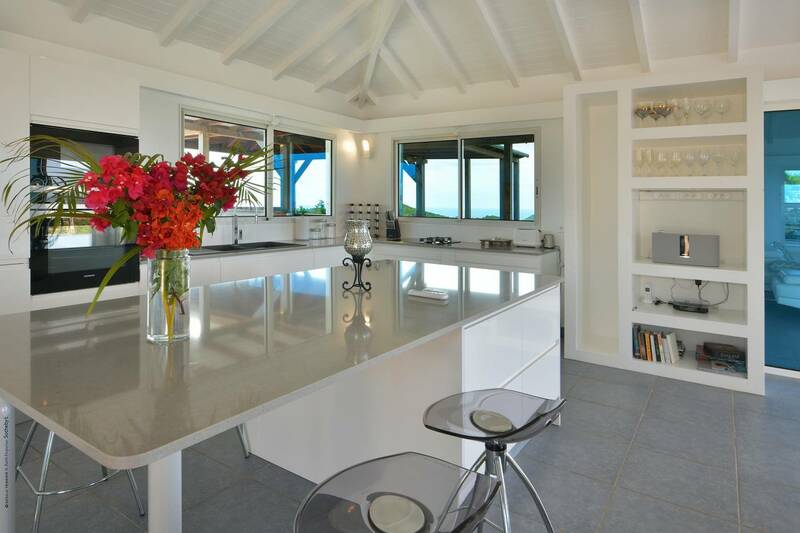 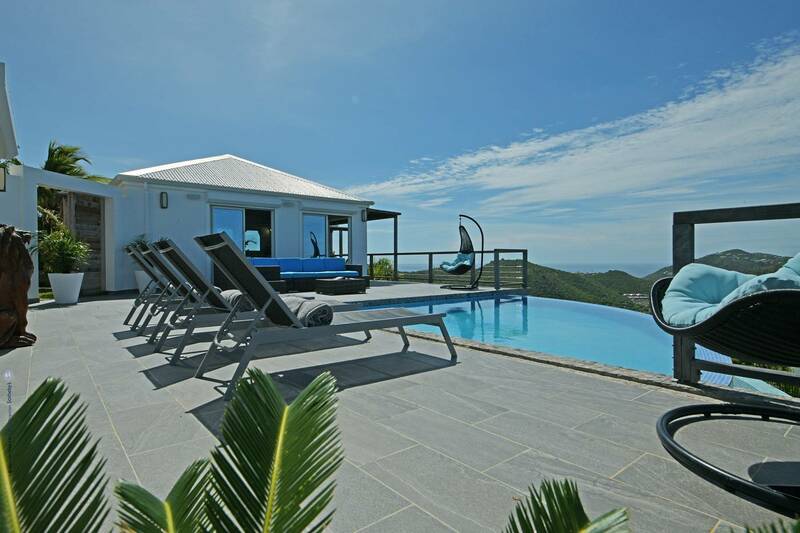 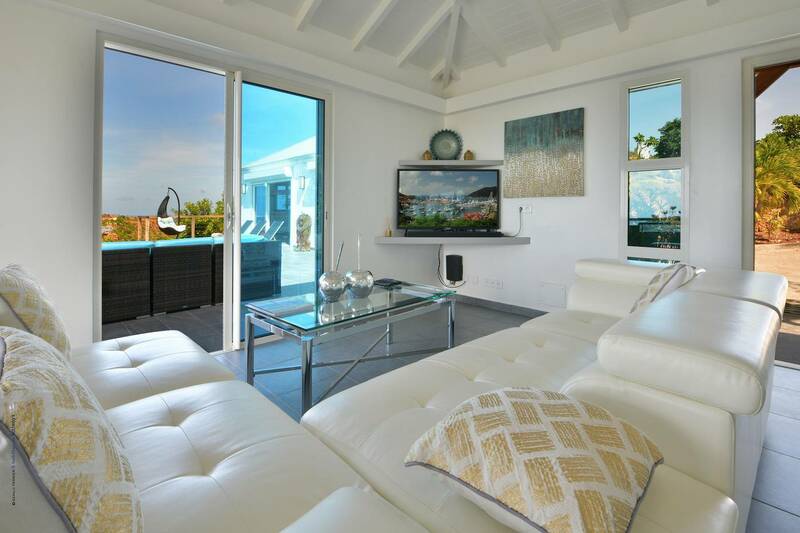 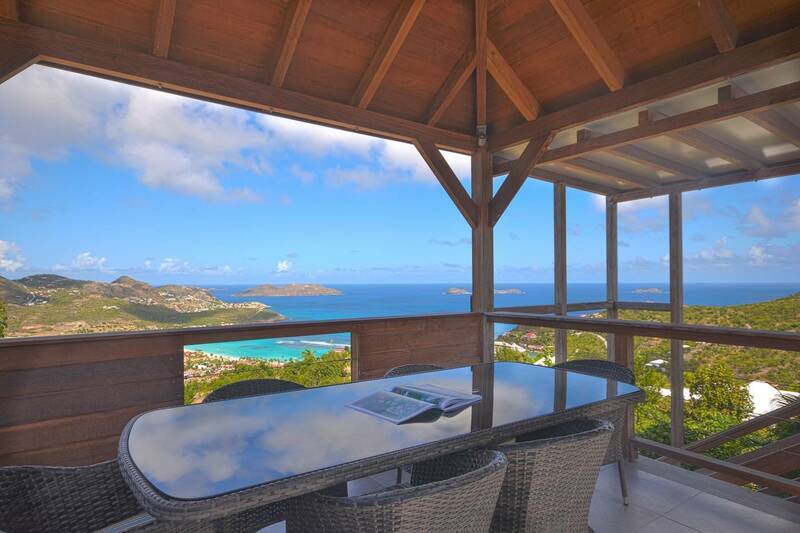 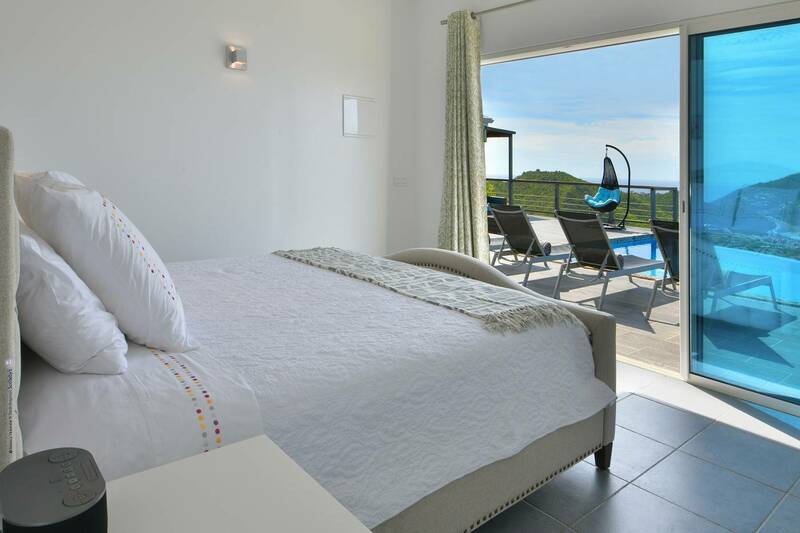 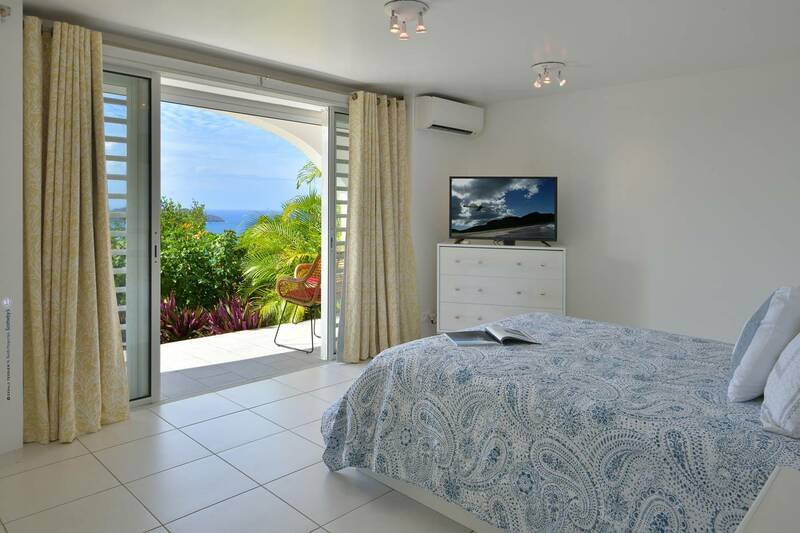 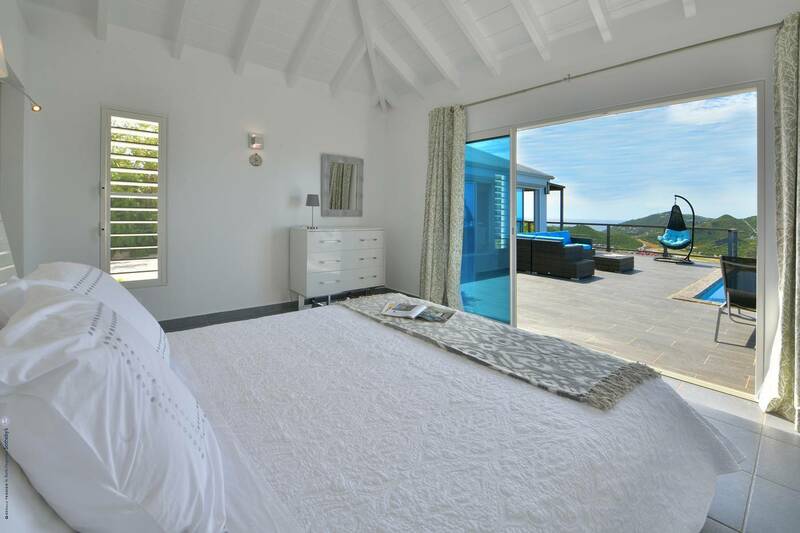 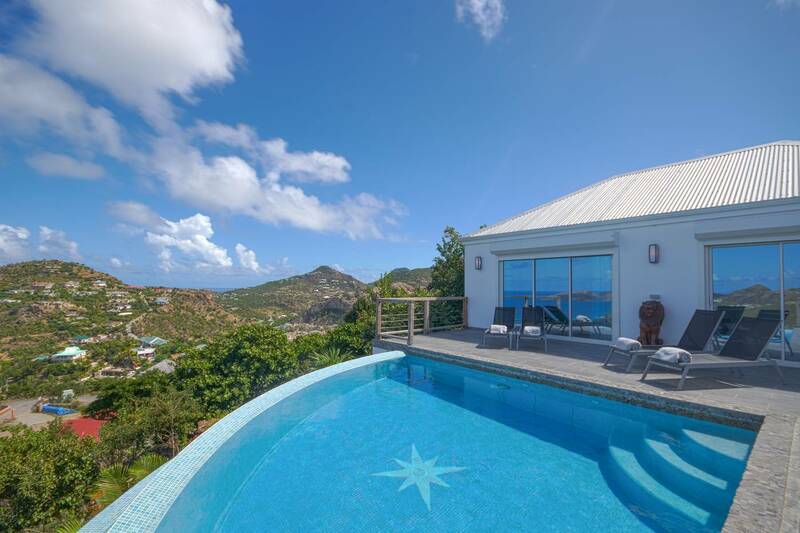 Poised high on the St. Jean hillside, this two bedroom deluxe villa offers privacy and a spectacular view of St. Jean Beach and the bustling little airport’s arrivals and departures in the distance. 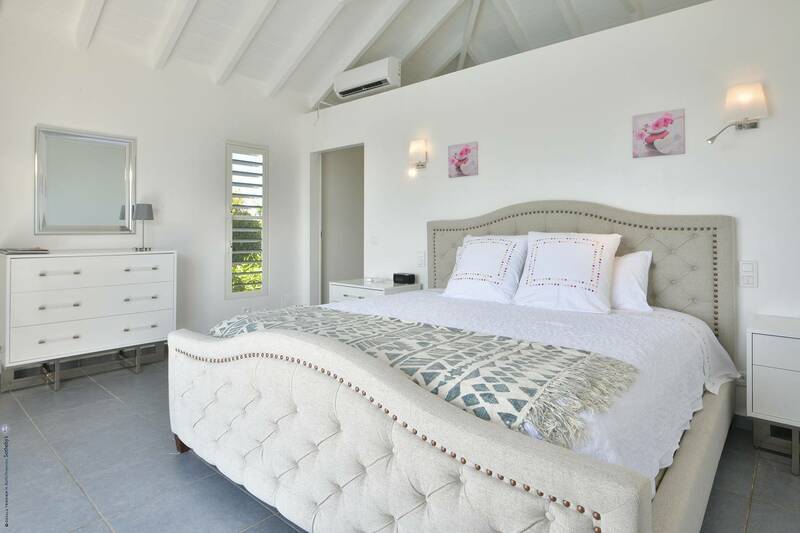 The entrance is graced with a lily pond and the main house includes airy living spaces with contemporary décor in an all-white palette. 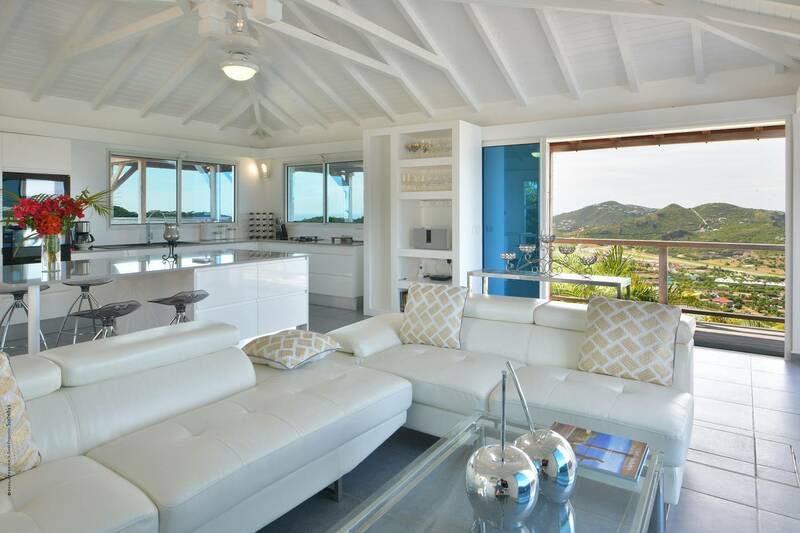 A well-equipped kitchen, an adjoining dining area and a guest bath are all in the main house as well. 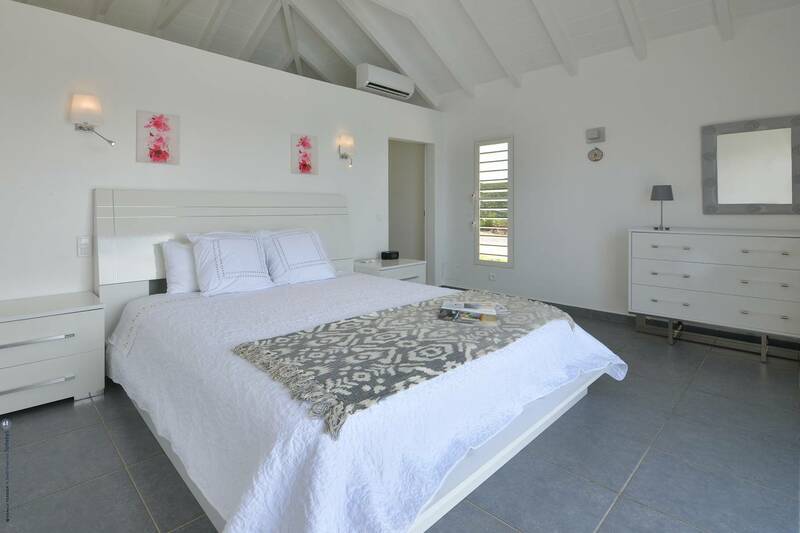 Two of the bedrooms (king platform beds) are in an adjacent pavilion and are identical in size. 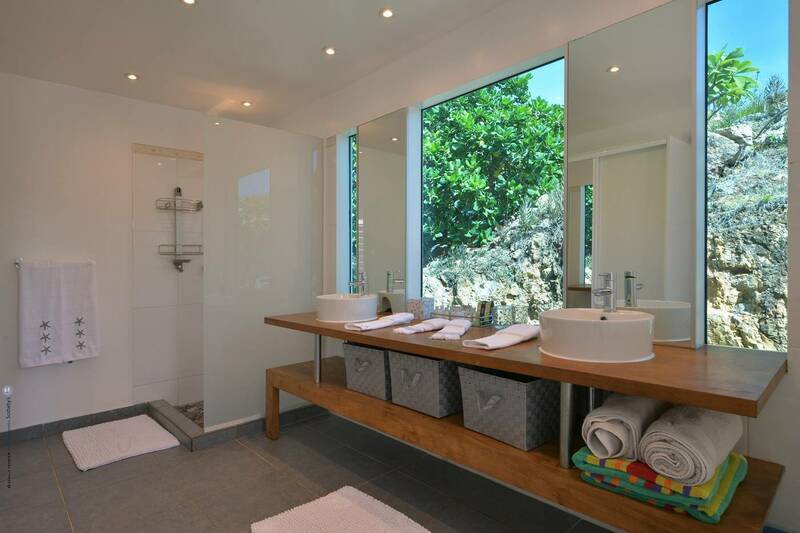 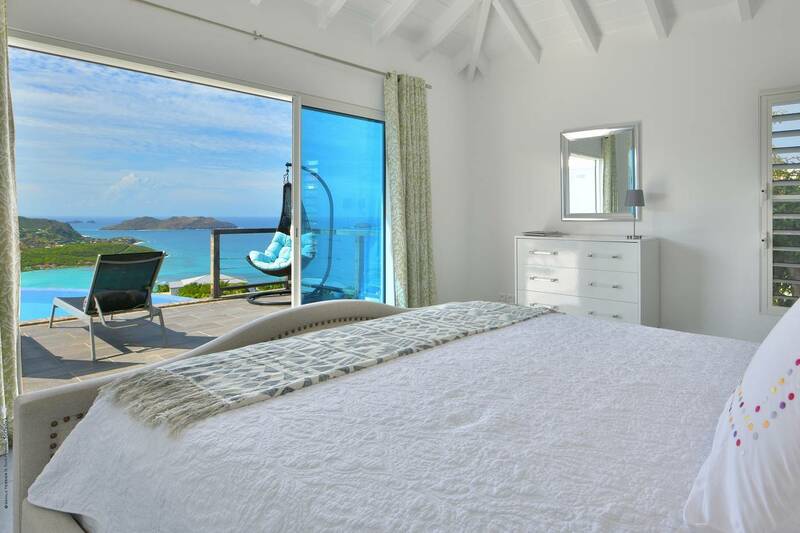 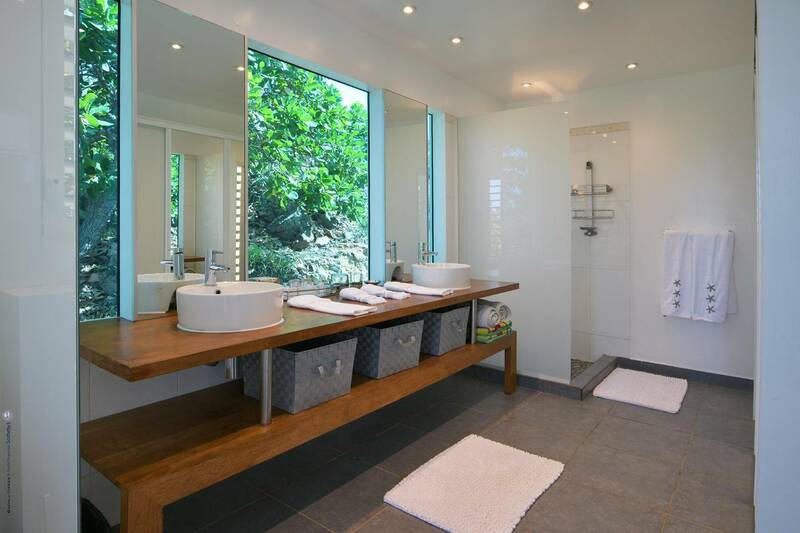 They feature en suite baths with double vanities and vessel sinks, access to the pool terrace and a fabulous view. 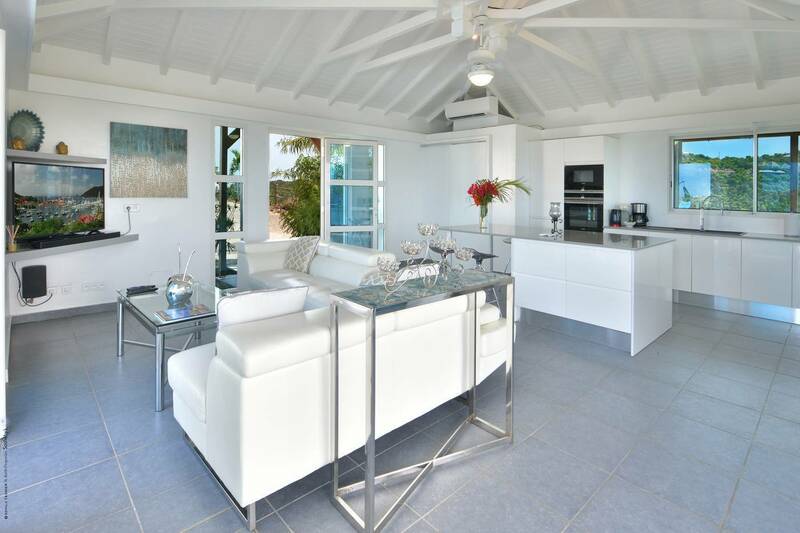 The focal point of the sunny terrace is a delightful infinity pool, heated in winter and chlorine free; there are loads of outdoor living-and-relaxing spaces including a covered dining terrace and a gazebo. 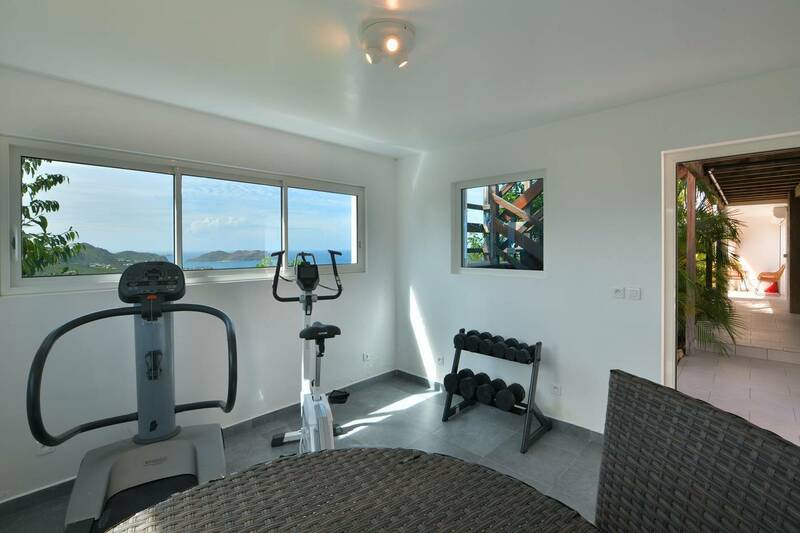 Villa Lilli also features a fitness room. 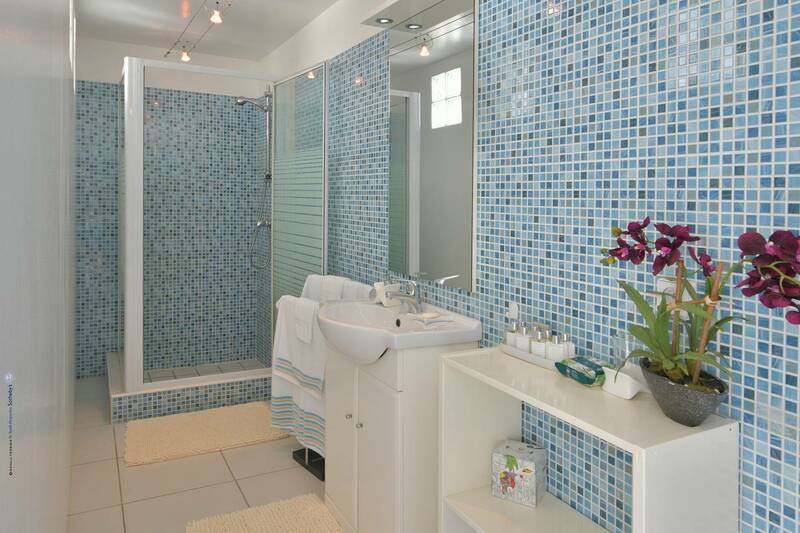 Techno amenities include U.S. Satellite, Wifi, surround sound and an iPod dock. 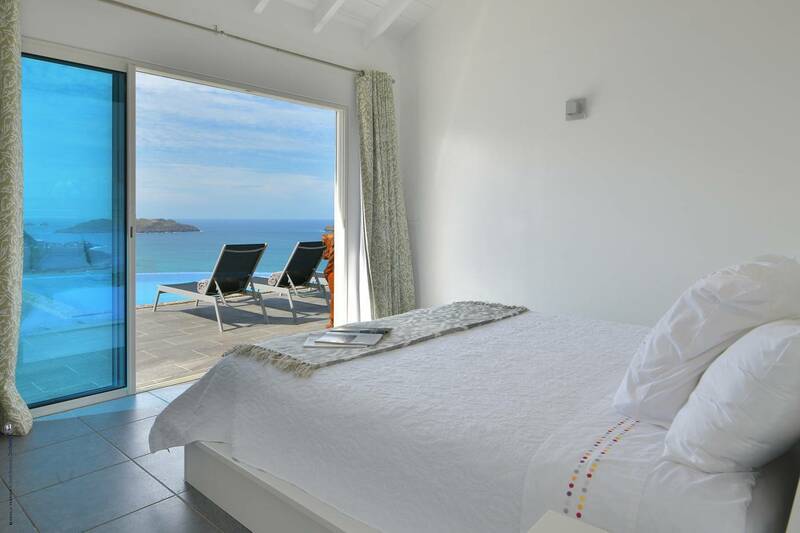 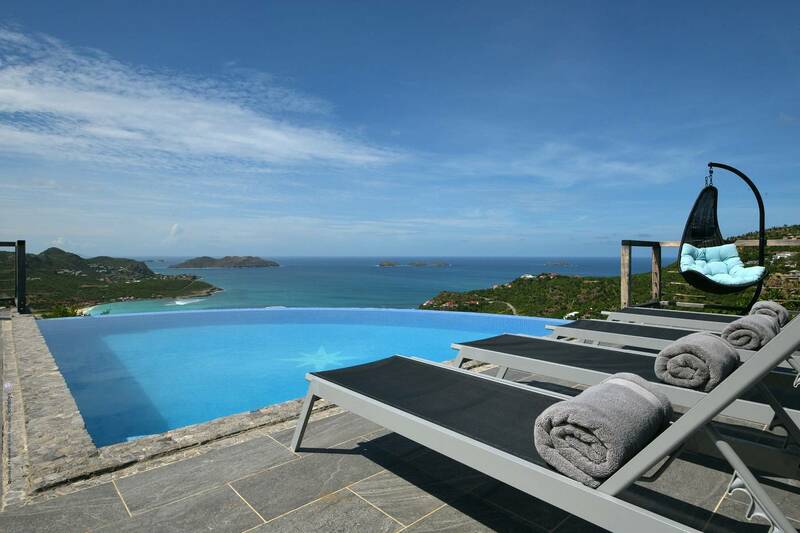 Romantic enough for honeymooners, it would also be a great choice for vacationing friends. 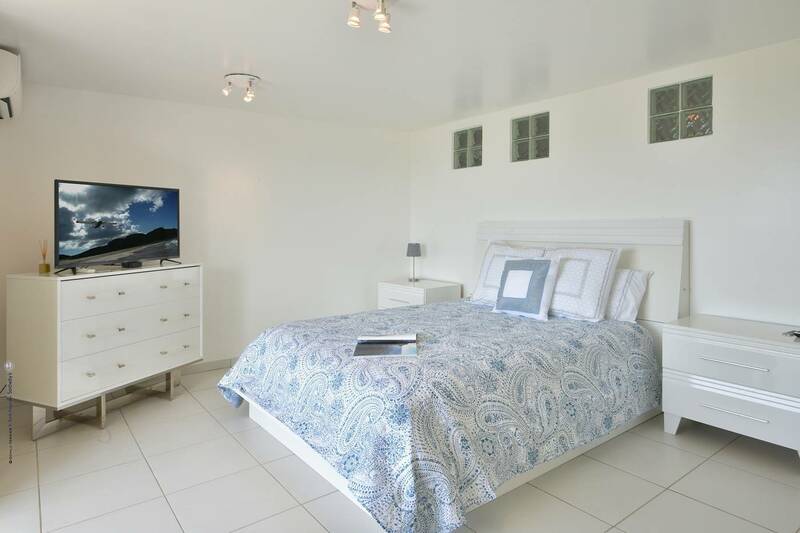 Note: A third en suite bedroom (French king) is located on the lower level a best suited for a teen or staff)..